First of all, the drive out to DuCard Winery is one of my favorite things to do on a weekend. From Warrenton, we take 211 West all the way to Sperryville, with stunning views of the Blue Ridge as you get out to Rappahannock County. Then south on 231, a smaller country road that parallels the Blue Ridge all the way down to a right-hand turnoff to the winery, one of those iconic Piedmont country roads—very narrow, very winding, and very beautiful rural scenery on both sides. And finally, we arrive at DuCard, driving through neatly tended rows of grapevines before arriving at the small winery and tasting room by the brook. 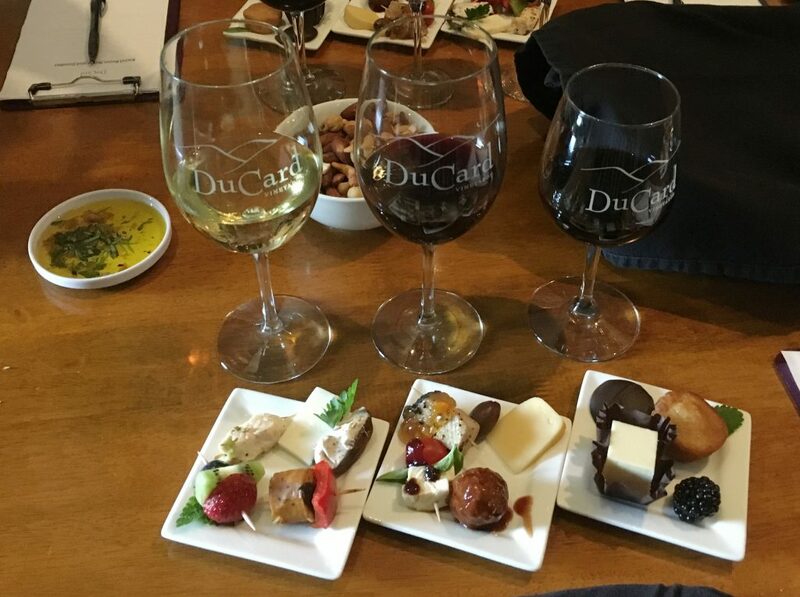 DuCard is one of the best vineyards to go relax and really feel like you’ve gotten away. The drive and the mild remoteness end up being a plus; by the time you arrive you feel like you’ve left the big, busy world behind you and are enveloped in a cocoon of rural, vineyard atmosphere. 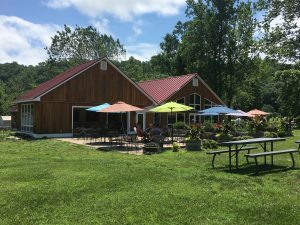 You have nothing to do but enjoy their carefully crafted wines and their peaceful location tucked into the foothills within walking distance of Shenandoah National Park. Ducard’s patio in their serene rural setting. The tasting room is welcoming, bright, and airy, and two outside seating options are available: a stone patio with brightly colored umbrellas, and a porch area which provides shade and fans on hot days. To add to our experience, it happened to be one of those absolutely perfect weather days. 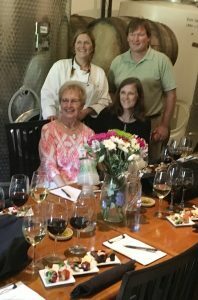 This day, though, we were there to enjoy more than just the wine and the rural atmosphere; we were to attend one of DuCard’s unique and elegant wine and food pairings, created and served by chef Kris Krammes. DuCard Winery is, as owner Scott Elliff readily admits, a “hobby gone wild.” He bought the property and started planting vines in 2000. About five years after that, he started making wine himself, and then in 2009 hooked up with Julien Durantie, a fourth generation winemaker from Bordeaux. A small winery, DuCard only bottles 1,500-2,000 cases of wine each year, choosing to follow the purist path of the small farm boutique winery from which the Virginia wine industry sprang. Grapes are all grown on the property—on about 20 acres across multiple sites—none are imported from anywhere else. They are carefully tended by a small staff and processed completely on premises under the careful eye of Julian. The only part of the winemaking that is not performed by DuCard’s small staff is the bottling of the wine; since the equipment is very expensive to purchase and maintain, they use a mobile wine bottling service who brings the equipment right to the winery on a trailer. This is a festive day, a sort of cumulation of all the years of past efforts when the wine is finally bottled. This day is open to the public for viewing and participating, which Kris highly encourages people to consider. It’s a lot of fun, she says, and compares the process to the bottling episode in I Love Lucy. “It’s just like that,” she said. The three-course menu with corresponding complementary wines. Which brings me to the actual experience of the pairing. The experience is a perfect combination of learning the wine process and enjoying the fruits of the winemaking paired with chef Kris’s culinary creations. It is important to them that the diners understand the wine process as well as enjoy pairing the wines with food. First, surrounded by stainless steel barrels and the grape press, we enjoyed DuCard’s light, refreshing 2016 DuCard Rosé paired with asiago cheese pretzel bites. The French-style rose is dry, with a hint of fruit (traces of cranberry, strawberry, and raspberry). This wine is made from the first pressing of red wine grapes and released every year around Valentine’s Day. We then moved into the barrel room where a beautiful table was ready for us, with three wines lined up with three small plates of complementary bites. The first wine was the 2015 Signature Viognier, an elegant, dry, crisp white which is not oaky or minerally. This is a special wine for Kris, since she actually helped harvest the viognier grapes in the fall of 2015. It was delicious paired with the small bites on the corresponding plate: lemon rosemary chicken; a tomato basil chicken sausage roasted with red pepper and basil; a medjool date stuffed with homemade honey pecan cream cheese; a slice of gouda-style cheese from Main Street Dairy; and a small fruit kabob. Chef Kris Krammes with guests. The second wine was a red, the 2014 Vintner’s Reserve Cabernet Franc, a 10 percent merlot and 90 percent cabernet franc blend, is aged a full year in french oak and then a more than a year in bottle before release. It was paired with a caprese pick with fresh buffalo mozzarella and garden tomato; espresso rubbed pork with an apricot glaze; a kalamata olive; a slice of smoked gouda; and a barbecue meatball sweetened with hickory syrup from Falling Bark Farms in Berryville. Time for dessert, featuring a port-style dessert wine, the 2014 C’est Trop. This is the juice of norton grapes infused with brandy and aged for two years in whiskey barrels. At 18 percent alcohol and 8 percent residual sugar, the wine is sweet but not syrupy—the brandy smooths out the sweetness. Delicious paired with a chocolate drop from Charlottesville Candy Company; a square of rum cake served on a lemon balm leaf; a large blackberry; and a square of plain or raspberry cheesecake. A bonus pairing afterwards demonstrated the wine’s versatility with an extra sharp cheddar cheese. Though all the bites were small, the variety provided to showcase each wine resulted in quite a lot of food, and we were quite full at the end of the experience. True to their local mission and similar to their winery practices, most of the ingredients in the food bites are local to the vineyard (herbs, tomatoes) or local to the area, utilizing products from Main Street Dairy in Stuart’s Draft, Falling Bark Farms in Berryville, and Charlottesville Candy Company. The experience was shared with a small, intimate group with the common bond of the love of wine and good food. Spirited discussions and laughter accompanied the wines and gourmet creations, and everyone had such a good time that we were even invited to a party one of the other guests decided to host at DuCard later in the season. Although the food and wine pairings are a highlight of DuCard’s offerings, please also consider a trip out for wine tastings, a Saturday on the patio with live music, or one of the many other events they host through the season: the Dog Days of Summer, a pig roast, and an oyster fest, just to name a few. And don’t forget to check out their wine club, with savings on wine throughout the year and additional benefits!